On February 19th, 1942, three months after the attacks on Pearl Harbor, President Franklin Delano Roosevelt signed Executive Order 9066, calling for the relocation of approximately 120,000 people of Japanese ancestry—30,000 of whom were children—into internment camps set up in the western United States and Arkansas. By comparison, only 7,000 German Americans and 3,000 Italian Americans found themselves in those same camps. The compulsory removal began in the spring of 1942. Families were suddenly forced out of their homes, leaving behind farms, businesses, communities, and all their possessions except what they could carry. The camps were built quickly and shoddily, and conditions were bleak. Buildings meant to house four people frequently housed up to 25. Food poisoning and dysentery were common because of poorly constructed plumbing. Desert rheumatism, a fungal infection, was widespread in the western camps, while camps in Arkansas suffered malaria outbreaks. Adult men in the internment camps who passed a loyalty test were allowed to volunteer for military service. The last Japanese Americans released from internment finally left the camps in late March 1946. Upon release, people were given $25 and a train ticket to their pre-war residence. However, having been incarcerated for several years, most found that they had nothing to return to, having lost everything over the course of the war. A congressional report issued in 1983 after a three-year investigation found little evidence that Japanese Americans posed a security risk and that the internment was motivated more by racism and hysteria than military necessity. In 1988, Ronald Reagan signed the Civil Liberties Act, which formally apologized for Japanese internment and paid each survivor of the government camps $20,000. This memorial, designed by Davis Buckley and Nina Akamu, was dedicated in 2000 at the intersections of D Street, Louisiana Avenue, and New Jersey Avenue NW. The focal point of the memorial is a sculpture of two bronze cranes, tangled in barbed wire. Around the memorial is a curved wall, listing the name of each internment camp along with the number of people held there, as well as a list of all the Japanese Americans who died in combat in WWII. 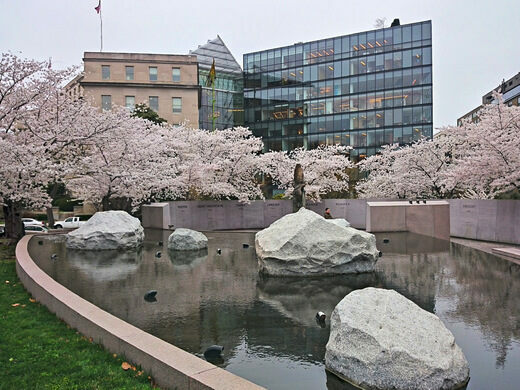 The memorial is located in Northwest, a short walk south from the Union Station metro stop, at the intersections of D Street, Louisiana Avenue, and New Jersey Avenue NW. Government testing at the asylum briefly explored using marijuana as a "truth serum" on Nazi prisoners of war. A line of abandoned, alien-like fortresses dot the mountains of North Italy.